Walking into Hall 1, you experience that wave of excitement and anticipation kept in check by the knowledge that your feet will want to divorce you by Day 5! As you go around, there are the same players in their usual spots. New booths for some of our friends – more open yet smaller. Same customers, same technology vendors. The conversations have a familiar theme: industry is under pressure, need for innovation, mega new entrants on the horizon and the increasing threat of piracy. And of course, the same rumor mill – as always! After a couple of years of going through the motions, it felt like this IBC had more energy. Indeed, there were more visitors – nearly 58,000! Hopefully it wasn’t just the bad weather that enticed people into the Halls? Openness wasn’t just associated with booth design, there was a buzz around Android TV. Retaining control of HDMI 1, while co-existing with the multitude of OTT that consumers demand was certainly of interest for many. Of course, there were some questions about how to protect the STB when it’s so easy to download apps – some of which can be exploited for illegal redistribution. And that brings me onto the other change. In our sector, the interest is clearly moving to post-delivery anti-piracy activities: watermarking, detection and enforcement. 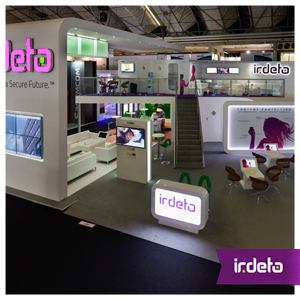 It was good to hear from visitors to our booth that Irdeto’s Just-in-Time Watermarking ™ demo had caused excitement due to its rapid detection speed. Of course, traditional content protection still has its place. But CA too is transforming. In CA, I see two opportunities. The first is, all-in for software based content protection. Even Tier 1 players are now seriously evaluating this option. Outsourcing and managed security services is the other trend. It’s only natural that content distributors would want to focus on delivery of excellent content and UX; leaving the operations to be run by companies that can bring synergies and expertise from across the globe. Not all the anti-piracy solution providers will be up to the task, especially in light of recent restructuring activities among some, but we certainly are! Speaking of opportunities, the media industry offers the tech giants – Facebook, Google, etc – with new fertile ground. They’re clearly investing in the media space. I wonder if they’ll be in the main Hall 1 next year – and who will be moved out to make room? Although we’re in a mature industry, this year’s IBC has left me with a sense of optimism. Mature doesn’t mean stagnant. There’s a determination and willingness to embrace change. Here’s to doing it all again next year! This entry was posted in Media & Entertainment and tagged Android TV, CA, Facebook, Google, IBC, Irdeto, watermarking. Bookmark the permalink.